Northern Ireland manager Michael O’Neill is hoping the football followers throughout the North West comes out and supports Mark Farren at the Brandywell tomorrow. O’Neill will manage a Northern Ireland Select to take on Martin O’Neill’s Derry City Select, at the Brandywell tomorrow afternoon (KO 3.30pm). The Candystripes all time leading goalscorer had his third brain tumour operation last month but given the severe aggressive nature of the tumour, he requires treatment at an elite cancer centre in Mexico and he travels with his wife Terri-Louise on Monday for six-week course of treatment. “Hopefully the public will come out that’s the main thing, hopefully the people of Derry come out and support Mark,” he said. “Mark’s Derry City’s all time leading goalscorer, so he’s a legendary player for Derry, so I think it would be great for him to see the level of support which is out there for him. The former Shamrock Rovers gaffer remembers making contact with the Greencastle man a few years ago when he was boss at Tallaght Stadium. “When Mark had first been diagnosed with a brain tumour, I wrote to him when I was Shamrock Rovers manager, so we had a little bit of connection going back to then and when I heard the news I just said listen lets try and do a game or something and it was great that Martin said yes straight away about the idea of a match. “The team which I will be managing is an Irish League Select, which Gary Hamilton has been responsible for putting that team together. 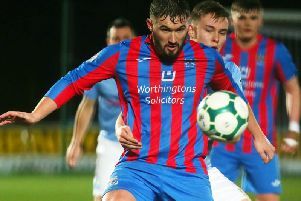 A lot of Farren’s old Brandywell team-mates such as Paddy McCourt, David Forde, Mark McChrystal, Ruaidhri Higgins and Kevin McHugh along with Bournemouth midfielder Eunan O’Kane are all playing, while James McClean and Blackburn Rovers centre-back Shane Duffy will also be in attendance. Admission to the game is £10 for adults and £5 for children.